(CBS/AP) Health officials say at least some of the salmonella-contaminated cantaloupe that has sickened nearly 200 in 21 states came from a southwestern Indiana farm, but they warned Thursday that until they've ruled out any other possible sources, people should avoid all cantaloupe grown in that part of the state. The Centers for Disease Control and Prevention late Wednesday identified Chamberlain Farms, in Owensville, as a source of the outbreak, which it blames for sickening 178 people since early July, including 62 who were hospitalized and two who have died. Shelly Burgess, an FDA spokeswoman, said Thursday that the investigation is still in its early stages and that it is too early to say whether all the contaminated fruit could be traced back to the farm. Health officials warn residents to discard any cantaloupes grown in southwestern Indiana bought on or after July 7. Tim Chamberlain, who runs the 100-acre Chamberlain Farms, said it stopped producing and distributing cantaloupe on Aug. 16, when the FDA alerted him that the fruit could be tainted. "We've had no production," he said. A statement on the FDA website said from June 21, 2012 to August 16, 2012, Chamberlain Farm Produce, Inc., marketed cantaloupes to four retail grocery stores with retail outlets in Vanderburgh, Warrick, Gibson, and Dubois County, Indiana, and Wabash County, Illinois; and also to four wholesale purchasers located in Owensboro, Kentucky, St. Louis, Missouri, Peru, Illinois, and Durant, Iowa, respectively. John Broadhead, an attorney for the farm which is about 20 miles north of Evansville, said it voluntarily withdrew its cantaloupes last week and that all of its retail and wholesale purchasers complied with the recall. Burgess said it isn't known how many cantaloupes the farm sold since people started getting sick. Salmonella is one of the most common causes of food poisoning in the U.S. and can contaminate a wide range of foods, including eggs, meat, unpasteurized dairy products and juices, raw melon and alfalfa sprouts, nuts and even spices. It causes diarrhea, fever and cramps, and although most people recover without treatment, it can cause serious illness in older people, infants and those with chronic diseases, according to the U.S. Department of Health and Human Services, which oversees the CDC. According to the CDC, the number of persons identified in each state with salmonella is as follows: Alabama (13), Arkansas (3), California (2), Georgia (3), Illinois (21), Indiana (18), Iowa (7), Kentucky (56), Massachusetts (2), Michigan (6), Minnesota (4), Mississippi (5), Missouri (12), New Jersey (2), North Carolina (3), Ohio (4), Pennsylvania (2), South Carolina (3), Tennessee (6), Texas (2), and Wisconsin (4). Chamberlain said health officials haven't told him what may have caused the contamination, so the farm hasn't been able to take steps to fix the problem. "We're waiting for the government agencies to tell us what to do," he said. Chamberlain said he has had no other problems at the farm since it began operating in 1982. Federal officials blamed tainted processing equipment and water at a Colorado cantaloupe farm for a listeriosis outbreak that killed 30 people last year. Indiana ranked fourth in the nation in cantaloupe production last year. Chamberlain said his farm would be considered medium-sized by Indiana standards. Cantaloupes should be disposed of in a closed plastic bag placed in a sealed trash can to prevent people or animals from eating them. 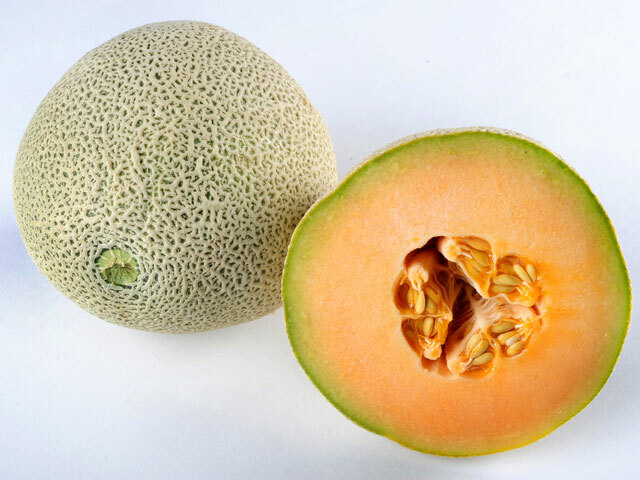 Many cantaloupes have the growing area identified with a sticker on the fruit, according to the CDC, but if no sticker is present, consumers should inquire about the source. Says the CDC, "When in doubt, throw it out." The FDA has more on the ongoing cantaloupe recall and risks.